As one of the top dental practices in North Texas, Frisco implant dentist Dr. Joshua Maxwell is proud to provide dental patients in Frisco with dental implants as a way to replace missing teeth. It is ideal to never suffer the loss of a tooth; however, due to trauma, severe decay, developmental defect, periodontal disease, failed root canal or some other factor, we may find ourselves in need of replacing a missing tooth. It is very important to replace missing teeth for a wide variety of reasons. It is not only crucial for the health of the remaining teeth, but for your general health as well. When a person suffers tooth loss, it effects our function and ability to chew; In addition, spaces created by missing teeth also cause bone loss, gum disease, tipping and crowing of the surrounding teeth, teeth opposite the missing tooth will slowly migrate out of their socket, puts undue stress on the remaining teeth, and causes an increase in clinching and grinding of the teeth which makes all of these issues significantly worse over time. Not mention the embarrassment and loss of self-esteem that accompanies losing your complete smile. A dental implant is an artificial tooth root that is precisely placed into your jaw. The implant will then be restored with a replacement tooth or bridge. Dental implants are very predictable and prove to be an ideal option for people in good general oral health. While high-tech in nature, dental implants are actually more tooth-saving than traditional bridgework, since implants do not rely on neighboring teeth for support. In addition, implant restorations never decay, while at the same time, maintain your natural bone where you would normally suffer significant bone loss over time due to the lack of stimulation of the missing tooth and root. As you know, your confidence in your smile and function affects how you see yourself, both as a person and a professional. Perhaps you hide your smile because of spaces from missing teeth. Dental implants look as natural as any other tooth in your smile. As a matter of fact most implant restorations feel, floss, and function just like your natural teeth. Nobody will ever have to know that you ever lost a tooth; as a matter of fact, you may forget as well. Replace one or more teeth without relying on, or treating the surrounding teeth. A couple of implants can also replace numerous teeth by bridging multiple replacement teeth between the implants. Make a denture semi-permanent or retained by screws. The ideal candidate for a dental implant is in good general and oral health. Adequate bone in your jaw is needed to support the implant, and the best candidates have healthy gum tissues that have periodontal disease well under control. A thorough exam will need to be completed, including x-rays. A 3D CT scan will be taken and used to precisely plan your implant. Models of your upper and lower arches will be fabricated. A surgical guide will be made using your models and the 3D CT scan. What is the surgical placement of the implant like? Due to the extensive planning done prior to your implant, the actual placement of an implant usually takes less than an hour from start to finish. The implant site is prepared by creating a small opening at the placement location. The implant is then threaded into place at a precise location and depth using the surgical guide created by the 3D CT scan. The implant can be placed within a fraction of a millimeter of the virtual computer planned placement. This precise technique can often eliminate the need for additional expensive surgeries such as bone augmentation grafting and sinus lifts. As far as the actual procedure is concerned, many patients have stated that the implant placement was quicker and more comfortable than have a traditional crown procedure. Orthodent, Anatomage and Invivo5 software provides Dr. Maxwell with a powerful tool for precise placement of your dental implants. He uses this state of the art technology to treatment plan and analyze your implant placement to provide the most ideal placement. Invivo5 is the 3D imaging software that has revolutionized implant placement! This technology allows for the precise planning of the implant placement in the highest quality of bone. In addition, this technology allows for ideal implant placement so that the best cosmetics and function of your future restoration is achieved. 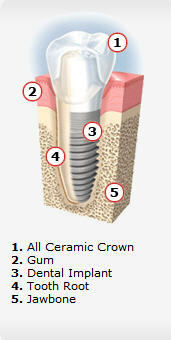 As a matter of fact, all aspects of your dental implant are taken into consideration BEFORE your procedure is started. Furthermore, this advanced technology and data is tied in with your surgical guide (used for exact placement during surgery) to complete the circle of virtual planning to clinical treatment. With the fabrication of your very own surgical guide, your virtual treatment plan becomes a real device that is used to accomplish your treatment exactly as planned. The Anatomage surgical guide is the first true next generation surgical guide that will make your implant placement ideal and extremely predictable with a dramatic reduction in time in the chair. Similar to your own teeth, you must maintain your proper oral care at home and continue with your regular dental visits. Due to the fact that dental implants are much like your own teeth, they will require the same care. Although an implant will not decay, you still need to keep your implant clean and plaque-free by brushing and flossing! After treatment, Dr. Maxwell and his hygienist will work closely with you to develop the best care plan for you. Periodic follow-up visits will be scheduled to monitor your implant, teeth and gums to make sure they are healthy. Contact Dr. Joshua Maxwell today for a free consultation for implants at his Frisco Dental Office 469-633-0550.